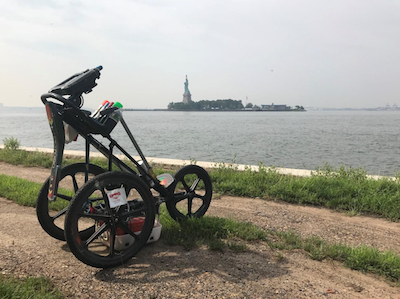 On historical Ellis Island, a major general contractor in the Manhattan area contacted GPRS to conduct ground penetrating radar scans of portions of the island to locate any possible utilities within the area they are restoring. Our client was concerned about encountering shallow utilities while they are performing upgrades. GPRS was able to perform the scans in a timely manner, detect multiple utilities within the work area and mark the surface in colored marking paint and flags to allow the contractors to work safely. GPRS also utilized a handheld GPS unit to create a CAD map to document our findings for future use.